Personality quizzes fulfil my insatiable need to ‘know’ who I really am. Then when I started my business, I found personality quizzes allowed me to effectively express myself in a way that I’d never considered. Instead of trying to dig for the truth (which was incredibly hard when I was new to business), I looked to my personality type. This allowed me to understand the most potent and magnetic parts of myself and how I might be able to explain that to others through my branding and messaging. As I experimented with personality quizzes, I also realised how powerful it could be for your marketing. You’ve probably heard that creating quizzes can help you generate new leads and build your mailing list… but let’s dive deeper than that! I love this quote from Seth Godin who says that the role of leaders is to 'give people stories they can tell themselves’. Not just stories about your brand. Not just stories about the products or services that you sell. But stories about the people you serve... helping them to know and understand themselves better! This is incredibly powerful if you’re in the transformational space and people come to you to learn more about themselves. This desire (or need) is what Abraham Maslow calls ‘self actualisation’ and relates to self-mastery and achieving one’s fullest potential. This theory is popular in marketing because it speaks to the needs, wants and motivations of the people you’re serving. So if you’re in the business of self-actualisation (i.e. helping people to achieve one’s fullest potential) then what better way to support your community than with a quiz that helps them to know who they really are? Now let’s talk about how to create one! When it comes to choosing a topic, I think it’s always best to go with your zone of genius. There was no doubt about it when I chose sacred social media as the topic for my quiz. After all, that’s why my clients come to work with me. They want to know how to implement sacred social into their lives. The quiz is simply another way of doing that! So why do your clients and customers come to you and how can you create a quiz that supports them in that? Now that you have your topic, you’ll want to look at the end goal. That is, what information is your community receiving at the end of the quiz? I call these ‘personalities’ but yours could be 'results' or ‘products’ or even ‘symbols’ depending on the topic of your quiz. I came across my ‘personalities’ quite intuitively. I was running Sacred Social for the first time and as we went through each of the modules (which are focused on the seven core pillars of sacred social media), I started to notice the way that different participants reacted to the content. While some of my participants loved particular modules and would power through them in an hour or two, other participants would feel blocked and take longer to finish. Then when it came to the next module, it seemed to flip the other way. This wasn’t about the content or the module that the participants were experiencing, it was about their own personalities, strengths and weaknesses. Through this experience, I realised that everyone experienced the core pillars of sacred social media in different ways. And that each person has a sacred social personality and a sacred social gift. So I started to map out each of these personalities and came up with seven archetypes that aligned with the seven core pillars of sacred social media. When writing out each of the ‘personalities', I focused on what I already knew about my community. I did this by identifying actual women who I believed fit into the ‘personality’ and used them as inspiration. Because my ‘personalities’ are related to archetypes, I also looked to some more traditional writing to inform my work. And I even aligned my archetypes with each of the chakras! This process took me 10 months and allowed me to develop really strong ‘personalities’ that I believe are super aligned and relevant for my community. But you know, don’t just take my word for it. Try it for yourself! After getting clear on my topic and personalities, it was time to map out the questions. It’s suggested that quizzes should take less than 2 minutes to complete so I went with 10 questions for my quiz. The questions formed quite naturally and I took lots of inspiration from this blog post here. I also made sure to include questions that I was generally curious about. What are they struggling with on social media? Where do they need the most help on social media? What are their social media goals? So I took these questions and added them to the quiz (knowing that they will be excellent market research down the track). Once you have your topic, personalities and questions mapped out then it’s time to create and execute your quiz. This is made super simple with my favourite quiz building tool Interact! When using the Interact quiz builder, you have the option to use a template or create your quiz from scratch. I loved looking at the different templates for inspiration and was able to quickly search for templates related to blogging, business and marketing. Through this process, I found a template that was all about finding your social media ‘secret sauce’. I chose this template as I felt overwhelmed starting from scratch and it allowed me to see how a complete quiz needed to look. Once you’ve added your branding, you can then add all of your questions. Mine were already created and written in a document so it was just a matter of adding them to Interact. Because I was creating a personality quiz, each of the questions had to correlate with a personality. This meant that I had seven answers for each question and each of them matched up with one of my seven personalities. My personalities were already mapped out before I started building the quiz so it was really easy to add them into Interact. The branding was also super customisable and I loved being able to add different images to the results. I decided not to go with a call to action button but will definitely add one to the quiz in the future. I’m not an expert when it comes to my email marketing system but it was so easy to integrate my quiz with ConvertKit. It was as simple as setting up seven different sequences (to match with my seven quiz personalities) and syncing those with Interact. Interact also made it really easy to test if everything was working… which gave me lots of confidence before pressing ‘publish’. Once the quiz was live, I embedded it directly onto my website. I also shared the quiz in Facebook and Instagram while working on a Pinterest strategy (along with seven new boards dedicated to each of the archetypes). The quiz has now been live for one week with the following results. I’ve also received a lot of positive feedback and love seeing and hearing about the results that my community are receiving. While the process was super enjoyable, there is still so much that I want to do and improve! I loved making this quiz so much that I'm already dreaming up new ideas - so keep an eye out for all the things! Did you love getting behind-the-scenes insight into my quiz and want to experience it for yourself? Click here to take the quiz now! 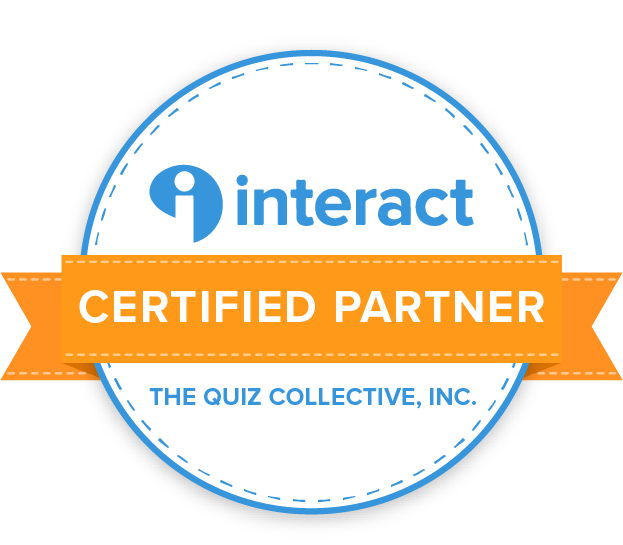 I’m also really to honoured to be a Certified Partner with Interact and highly recommend their incredible quiz building platform. Want to know more about Interact? Just click here!